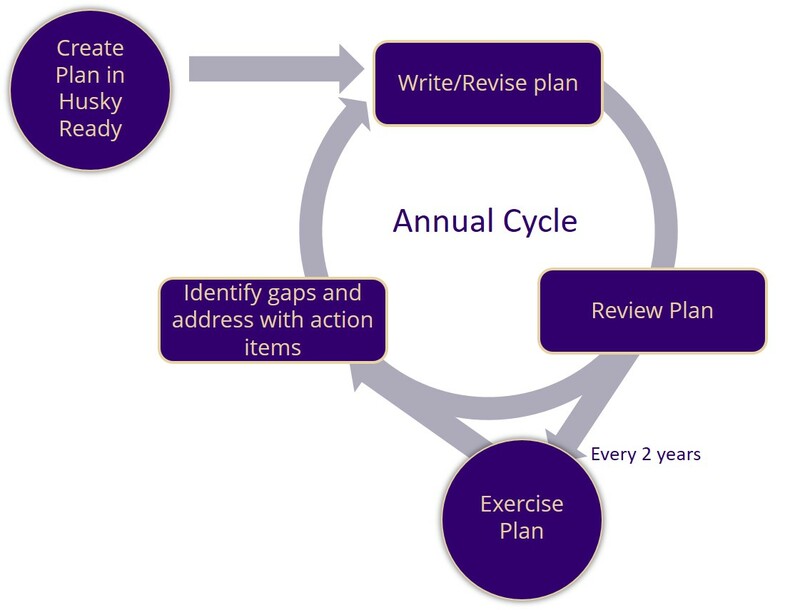 The Business, Academic and Research Continuity (BARC) program supports the enterprise-wide planning for continuity of operations (COOP) following a major disruption that limits the ability of University of Washington administrative, academic, and research units to meet operational or staffing needs. Through COOP planning, we can all help to maintain the operations, reputation, and revenue of our individual units and the University as a whole. In an effort to better prepare the University, Business Continuity Management planning was mandated in April 2007 by the Office of the President through UW Administrative Policy Statement (APS) 13.2. This APS is intended to support academic and research continuity efforts as well, to produce a holistic emergency preparedness effort that will benefit the University community. The BARC program uses Husky Ready as the primary enterprise-level business online continuity package for all University of Washington locations, both foreign and domestic. There is NO COST to departments for the use of Husky Ready. UWEM staff provides support to all users of this online planning tool. To contact the University’s business, academic and research continuity manager, Megan Levy, please call 206-897-8000 or e-mail us at levym2@uw.edu. Each unit should create a continuity plan and house it in the Husky Ready system. Husky Ready is meant to walk you through the necessary steps and data you need to develop your plan. Additionally, our BARC manager can assist you in getting your plan started, understanding the process, exercises, and final approval of your plan. The first step is to create your plan! Once the initial plan is written, continuity planning is a continuous cycle of review and revision, as staff, operations, facilities, and technical requirements change. The University of Washington requires that plans be updated annually and exercised bi-annually to be considered up-to-date. What is continuity of operations (COOP) planning? Continuity of Operations (COOP) planning is the process through which an organization, department, or unit prepares to maintain critical functions despite a major interruption to operations. This interruption could be a fire, an earthquake, a student protest, or something you’ve never even considered. The difference between COOP and other plans around natural disasters and other disaster planning is that COOP focuses after the initial response—it outlines what happens between the incident and normal. At UW, we take an all-hazards approach to COOP planning to ensure we are not getting too caught up in the “why” of operational disruption, but instead the “how” of restoring operations at various levels of disruption. Often when people think of continuity after a disaster, they assume the entire University, city, or region has been taken down. However, a disruption that happens only to your unit or department, like a fire or loss of fiber optics for example, can put your operations at risk while everyone else in the area is continuing business as normal. Through the process of COOP planning, your unit can explore the key responsibilities you have, what you rely on to meet those responsibilities, and how to pre-plan workarounds. Restoring operations is much easier in an emergency situation when you have a documented set of first steps. To keep our business, academic, and research operations going without losing valuable data, revenue, or reputation, it is essential that every unit create their own plan—you know your work best; you’re the best person to plan to get back to work. An ongoing planning process to ensure that the necessary steps are taken to identify the impact of potential losses, maintain viable recovery strategies and recovery plans, and continuity of services for all business and administrative units. Business continuity promotes pre-event decision making to address operational disruptions, including working with limited staff, loss of facilities, and loss of systems. An ongoing planning process to ensure that instruction continues after a disruptive incident. Academic continuity is intended to reduce disruptions in the faculty’s ability to provide instruction and the student’s ability to receive instruction. Academic continuity promotes principles that provide graduate students with assurances that their work will be safe and available to them in the event of a campus disruption. Research continuity is the process of ensuring that research projects will endure after a disruption in services. This is done by planning and mitigation steps that protect the researcher, data, research subjects, equipment, records and critical supplies that may be impacted by a disruption. A disruption in services may include events such as a power failure, communication disruptions or an inability to access your workplace due to safety or transportation issues. These links provide additional information and resources available to UW faculty, staff,research departments and historical collections. Also, don’t forget: UW Emergency Management is always available 24/7. How does BARC benefit me? Business continuity planning and similar preparedness efforts are often seen as either unrelated to the business plan or, at best, a necessary evil. Businesses that do have a plan seldom review it for consistency with the current state of the business. A plan written three years ago is likely incompatible with the existing business. 35 – 40% of businesses disrupted by a disaster without a continuity plan never reopen. Five-year average of U.S. disaster losses is 2.5 billion (pre-Hurricane Katrina). Every dollar spent on disaster mitigation saves $7 in recovering disaster-related economic losses. The rate of occurrence of natural disasters has increased by 40% in the last 15 years. Every business will face some form of disaster at some time. Those businesses that have prepared will be in a much better position to prevent a serious disruption of their operations. Additionally, prepared businesses will be able to recover in a more cost-efficient, timely manner because much of the initial recovery requirements and resources have already been identified. Whether you’re considering your life’s work in research assets or continuing to make payments on your family home, continuity planning helps your plan to protect against, mitigate, and recover quickly from disaster. Planning to preserve operations keeps losses low, improves your long-term viability, and ensures the strength of the University enterprise-wide. After a major disruption, people are eager to return to normal; the better we plan pre-event, the easier this transition will be. Some folks look at business continuity as a necessary burden. You need to have it because your investors or insurance company requires it. The reality is that a well thought-out business continuity plan can actually be a decisive marketplace advantage. Remember the movie “Forrest Gump?” The Bubba-Gump Shrimp Co. was struggling to get its business off the ground. A large storm hit the area, leaving the local shrimp boats devastated, except for the Bubba-Gump Shrimp boat. That storm created opportunity for the Bubba-Gump Shrimp Co. which was in a good position to take advantage of it. Was the Bubba-Gump Shrimp company lucky? “Luck is what happens when preparation meets opportunity”. This 2,000-year-old piece of wisdom is still true today. Companies that have developed a vibrant business continuity program and a preparedness mindset will be in a position to take advantage of the opportunities that may arise from a disaster. They will be faster and more efficient in recovery than any competitors that have not developed a business continuity program. When the customers come knocking, it will be on the doors of those that are open for business.